Colors are not only a delight for the eyes and soul, used skillfully they have the powers of an unseen witch. 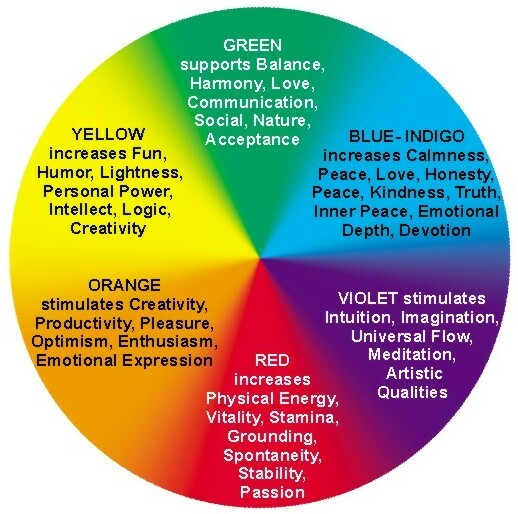 It is proven that our body can be affected in specific ways by surrounding colors. Chromotherapy is thus considered an noninvasive alternative treatment. The importance of sunlight as the only source of light and heat is known from ancient times. With these properties it maintains life on earth. But the positive effects it has on us are endless, researchers are constantly preoccupied about their discovery. Besides natural energy, essential for vital biochemical processes (eg in photosynthesis, bio–metabolism, protein biosynthesis), the sun provides many other benefits for mind and body. Harmonious color absorption by the body is considered to be necessary for maintaining health naturally. This is why “ sunbathing” is so important. In therapeutic applications deficiencies or imbalances of specific colors are supplemented with artificial light. These can be used for noninvasive treatment of a wide range of diseases. Red color is characteristic to the stimulation of neurons, adrenal glands and sensory nerves also it improves blood circulation. This primary colour induces subtle but intense effects in the management functions of the brain and nervous system and in many biochemical and physiological processes. Because of its restorative effects, red is recommended in small doses and only with blue or green for therapeutic use. Orange is a combination of red and yellow. Its effects are thus much stronger. Among the results of cromotherapy using this colour includes also increasing body resistance against infections.Orange is much more used to cure stiffness and spasms. He also plays an important role in increasing metabolism rate and strengthening the lungs, spleen and pancreas, but also in maintaining normal blood pressure. It is interesting to note that this color induces soothing emotions and enthusiasm. Research on chromo medical laboratories indicates that bright yellow rays help the body’s motor mechanisms. This color is also useful in strengthening muscles and maintaining digestive funtions. However, prolonged use gives rise to acidity, colitis or hemorrhoids. Excessive radiation absorbtion of yellow can increase the risk of diseases such as heart rate and delusions. Yellow therapy leads to a general increase in the level of intelligence and promptness. A dilation of arteries is recorded when green rays penetrate the body. But its excessive absorption has harmful effects on muscle tissue and pituitary gland. Green has a favorable impact in inducing positive thinking therefore is prescribed in stress management. Blue increases metabolism reaction and is often used in wound healing. This color gives soothing effect to the mind / intellect and supports intellectual functioning operation during meditation practices. This color is suitable for chromatographic purification. In addition, relaxes and slows neuro-muscular system, cardiovascular and lymphatic systems. Purple can be used in maintaining potassium levels in the body. Specific high frequency radiation using this color inhibits tumors. Unbalanced appetite can be controlled by this color. Every time I get feedback from my readers makes me understand how this articles are sometimes a helping hand and a good read. Thank you for your beautiful words. You have no reason to doubt for.